⟩⟩⟩ Transmitting live video over adsl/fiber internet connection to any location in the world. Reception over TV set. 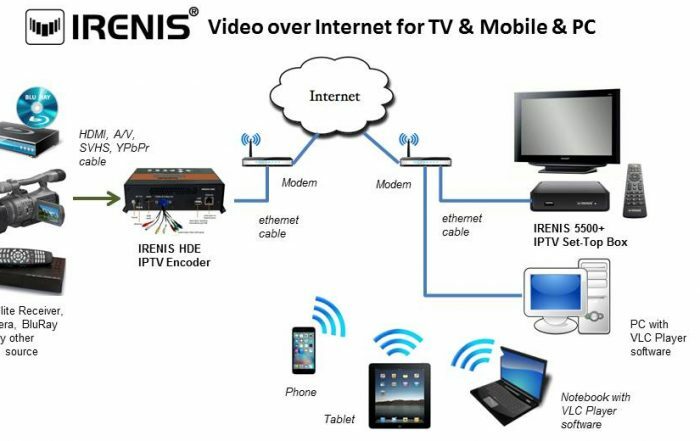 Using IRENIS encoder and a PC with VLC Player software you can transport any HDMI or SDI or CVBS (Audio/Video) signal in real time over internet in HD quality. you can pull the signal form a distant location whenever you want to watch it. internet connection on both sides. The upload and the download speeds of the internet connections must be minimum 1 Mbps for low quality, 2 Mbps for SD (standard definition TV), 4 Mbps for HDTV (720p/1080i). IRENIS Encoder & Streamers are designed for TV signal distribution in excellent quality over LAN and internet. The H.264 compression technology features low latency and low bit rates for IPTV/OTT systems. The high-efficient bandwidth use saves bandwidth cost through all its resolution range. Sending live video signal over internet to a distant location. Watching a live camera from a distant location. Instead of internet, you can also use it on your LAN.